"If art is to survive, it must describe and express people, their lives and times. It must communicate." A deeply unfashionable sentiment at times, yet it served Raphael Soyer well. Early in his career as a painter he received acclaim for his detailed, sensitive portrayals of unemployed women and men struggling to keep their dignity and feed their families after the stock market crash of 1929. When abstract expressionism triumphed in the post-war years, Soyer's art went out of style. Nevertheless, he continued his explorations of the many faces around hi, particularly artists and writers of his acquaintance. With that in mind, who is Rosemary? I haven't been able to identify her but Soyer's portrait and its title indicate his interest in the process of thought. Her eyes focus inward, distinct from averted away from the artist and, by extension, the viewer. It's unlikely that she is thinking about her current occupation as sitter. Her pursed lips and arched brows suggest a satirical bent to her thoughts. Her crossed arms portend the possibility of dark clouds resulting from any conclusion. Although she wears ordinary street clothes and sits on a straight- backed chair she wraps herself and the artist also wraps her in dignity. This portrait is, if it has anything in common with photography, an exercise in time-lapse vision. Brown, blue, and grey colors that predominate in the portraits of women by the British painter Gwen John (1876-1939) are used by Soyer to effect a similar subdued atmosphere. As the son of a Hebrew scholar, Soyer was raised to value signs of human ratiocination. 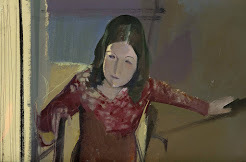 Raphael Soyer (1899-1987) was one of six children; both Raphael and his twin brother Moses would grow to become artists. Born in provincial southern Russia, the family was forced to emigrate in 1912 as turmoil engulfed pre-Revolutionary life for poor Jews. The family emigrated to the United States where they settled in the Bronx. He studied art at the National Academy of Design and the Art Students League, and later taught at both institutions. He chose to paint in a realistic and humane style even when abstract expressionism was the reigning orthodoxy in the New York art world. 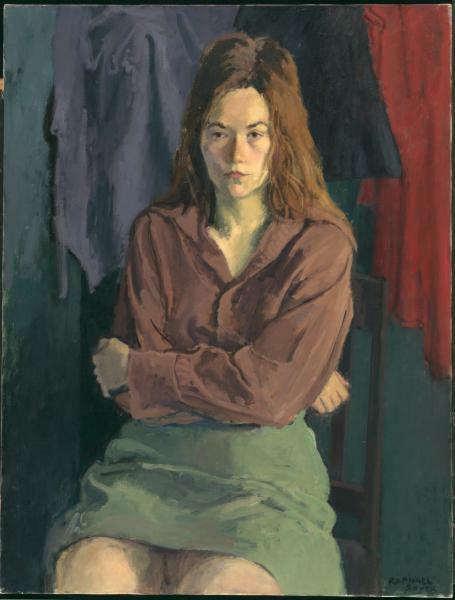 Raphael Soyer - Rosemary in Thought , 1975, oil on canvas, Smithsonian Museum of American Att, Washington, D.C. The key sentence is "When abstract expressionism triumphed in the post-war years, Soyer's art went out of style". What a terrible shame :( His family portraits, cafe scenes, Depression community struggles etc were sensitive. And for me personally, evocative of a community I knew very well - Russian, Jewish, working class people. Thank you for reminding me of someone I hadn't looked at for years. You're welcome, Hels! isn't it hard to believe that anyone could look at a work like "Rosemary in Thought" and not be impressed? Rouchswalwe, how I wanted to find out more about Rosemary. I kept this picture in my file for months as I searched. Now my hope is that someone who sees it here can tell us more! Rouchswalwe and all, in his diaries Raphael Soyer writes admiringly of artists Sophonisba Anguissola an Artemisi Gentileschi and comments about their "beautiful" names. He also admits that, until 1977, he had never known about Anne Vallayer-Costa. Women have been thinking and reclaiming women artists, thanks to Linda Nochlin and others who have followed in her path.